Ruth Porat (b. 1957) was born in England to Jewish immigrants from Israel. Her father was a Holocaust survivor who escaped to a kibbutz and fought in Israel’s War of Independence. He later became a physicist and moved the family first to Massachusetts and then to California, while doing research at Harvard, MIT and the National Accelerator Lab in Palo Alto. 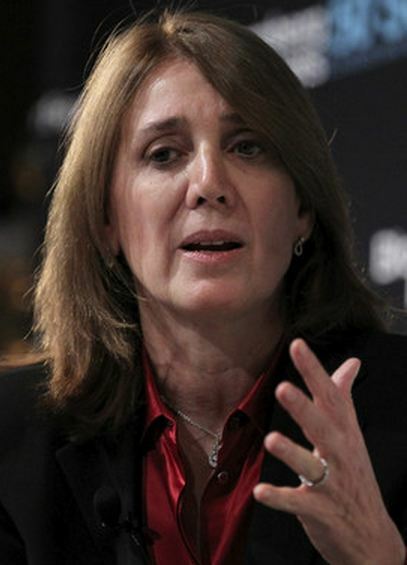 Ruth Porat studied at Stanford, and has Master’s degrees from both The London School of Economics and The Wharton School. Throughout most of her career, Porat worked for Morgan Stanley, rising all the way up to the rank of CFO and Executive Vice President. Before that, she served as the Vice Chair of their Investment Banking division, and the head of their international Financial Institutions Group. During the 2008 Financial Crisis, Porat was a chief adviser to the US Treasury, and was praised for helping to save AIG from total collapse, an event that would have completely tanked the economy. Not long ago, she was nicknamed the “Most Powerful Woman on Wall Street”. At the same time, Porat has been married for over 30 years, and is a mother of three, maintaining a steady “work-family mix”, as she calls it, and encouraging her co-workers to do the same. As one of only a few women with such high positions in the financial world, she has become an important role model. She is also a breast cancer survivor. In the past, working as a co-head of Morgan Stanley’s tech investment division, she directed funds to companies like eBay, and Amazon in their early days, helping to turn them into the giant companies they are today. Due to her vast knowledge of both the financial sector and the digital world, she was recently hired by Google, and as of last week, is their new CFO. Transgressions of man towards God – Yom Kippur atones for them. Transgressions of man towards man, Yom Kippur does not atone for them, until one seeks forgiveness from one’s fellow. This entry was posted in Business & Finance and tagged 2008 Financial Crisis, AIG, Amazon, California, CFO, eBay, England, English Jews, Google, Harvard, Holocaust, Investment Banking, Israel, Kibbutz, London School of Economics, MIT, Morgan Stanley, Palo Alto, Stanford, The Wharton School, Vice President, Wall Street, War of Independence on June 4, 2015 by Jew of the Week.